If you dream of getting your film up on the big screen, eventually you’ll encounter a festival that wants your movie in DCP format. What's an independent filmmaker to do? Pay someone? Gosh I hope not, you really wouldn’t be an indy filmmaker if you had the money to pay for a fancy transcoding specialist. That money should be up on the screen. And have you seen transcoding specialists? These people drive to work in vintage Lamborghinis and wear gold chains like they were sweaters in Wisconsin (layers people, key to surviving a Wisconsin winter). Nope, you’re going to have to rely on your grit and determination: you’re going to have to learn how to make a DCP master. BUT THIS IS GOING TO BE EASY! If you follow my exact instructions (using my short film "Deadly Class" as a learning example) you'll produce a glorious DCP master in no time... As long as you consider 12 hours of rendering time to be no time. What is DCP? It's a video format that is made up of a bunch of JPEG images, played back really fast. There’s nothing going on in between frames, unlike other encode formats. So the encodes are pretty large. Why are festivals all about DCP now? Because the ridiculously expensive 4K Christie projector the theater owner purchased can only playback at 4K resolution when the source is a DCP package. If you want your movie played on a crummy Epson projector set up in a basement somewhere you can certainly plug in your laptop and playback an MP4 at 1080p. But if you want to see your creation on a 50 foot screen you’ll need to use this format, which the Christie corporation has promised the theater owner will not change for many years. This is the only way Christie can convince theater owners to pay $140,000 for the unit (without the lens, the lens costs extra!). How do I know if I made my DCP correctly? If the Christie projector can play your DCP, you made it correctly. Unfortunately the festival director that defined the submission criteria does not have a Christie projector. If festival directors had that kind of money they would be in the transcoding business. Festival directors use a variety of free tools to determine if your DCP is “correct”. These tools are NOT made by the Christie corporation, so there is always a chance that the tool used to review your content will “fail” the package even if it could be successfully played by the $140,000 projector. If the free tool says your package is incorrect, is it so? This is a conundrum, wrapped in a riddle, dipped in chocolate and then once again wrapped in bacon. Though delicious, at the end of the day it doesn’t really matter, because you won’t get into the film festival if you don’t get past the festival director. So not only does your package have to play on the Christie projector, it has to work with every tool in the pipeline that will touch it. I learned this lesson the hard way. You can save yourself the hassle and remember to ask each festival you submit to how they intend to validate your package (and then perform the exact same kind of validation before your submit). You said this was going to be easy? It will be. You are basically going to take a 2K or 4K H.264 encode, run it through a tool, and the tool will produce a 2K or 4K DCP package. It will just be another encode of your film. Do I need to consider the target playback environment (the theater)? Of course, the encode you provide to the DCP tool must conform to theatrical sound level standards. This is the one thing that has actual, real world consequences. If you blow out the nice theater owner’s speakers with your crazy +10db audio track you will literally bring down the festival. Imagine this: that scene of yours with the gunshot blows out the speakers, the lights come up, the festival ends, the theater has no way to replace the speakers, the festival director is sued, you are sued, you declare bankruptcy and then you don’t click the little Google ad link on this page, and then I’m out of business too. See how this hurts everyone? Always keep your mix well below 0db, and always choose the “Theatrical +0db” sound level when given a choice at encoding time. "Maximum bitrate violation detected. Input frame with index 42 is too large." I spent many nights researching this error, I went through Adobe's support queue, and the best explanation I could come up with is that the metadata Quvis produces plays fast and loose with the DCP specification, and EASYDCP doesn't like packages that play fast and loose. I know for a fact my encode was not "Above tolerated limit: 110 bytes". The only way EASYDCP would conclude my encode was too large would be if some poorly written encoder fed EASYDCP incorrect metadata. I'm looking at you Quvis corporation! Sadly, even though the link to Quvis.com is included in Premiere, Adobe does not provide any kind of support for the Quvis 4K encoder (since it comes from a third party). Why does Adobe smear their fine name with this really horrible encoder? That's another riddle wrapped in bacon. Install DCP-O-Matic. You'll end up with a client and a server process. The client sends encode jobs to the server process. From your editor (hopefully Premiere) make either a 2K, UHD or 4K encode of your content in H.264 format (in one of the approved DCP frame size + framerate combinations). 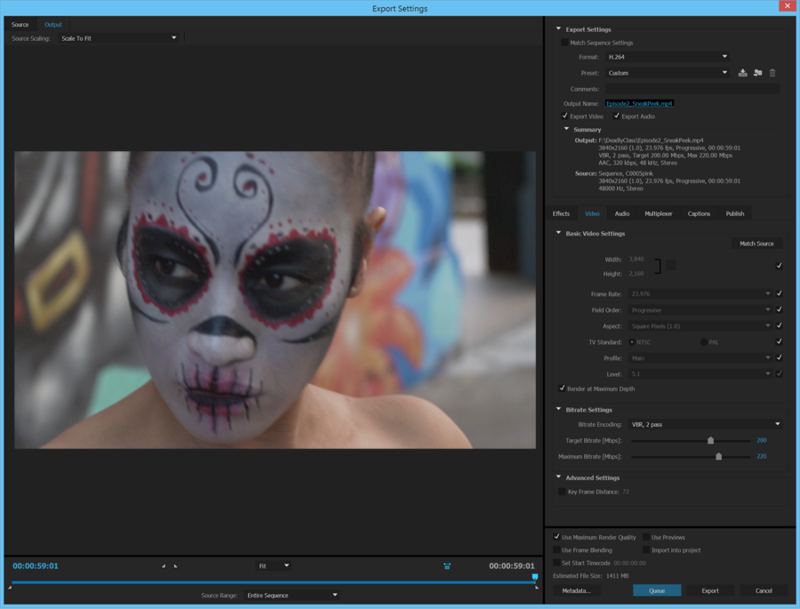 The encode should closely match the frame size and framerate of your footage. Don't make big changes to the content at this stage, you should have previously used "interpret footage" inside the editor for changes to framerate (for example). See my article here on how to do that. Here is an example of my encode settings. I set a target of 200 Mbps, even though the source was captured at 100 Mpbs in the camera. There is some small benefit to setting an encode target over the source bitrate, as you will avoid transcoding artifacts, however I would not go above a 200 Mbps target (with a 220 Mbps max size), as there is no visible improvement at that point with 100 Mpbs source and you could ultimately run over the 250 Mpbs limit imposed by DCP if you're not paying attention. Next run your encode through DCP-O-Matic. The DCP specification includes a 24 fps framerate target, but not 23.976, and so DCP-O-Matic will "upconvert" your 23.976 source to 24 fps. Congratulations your content just got shorter! DCP-O-Matic will keep everything in sync, but you will stay up at night wondering where your .024 frames went. Install EASYDCP here. You will have to dig around to find the trial version, because the site hides it from you. But it's there. And it's free. And it has everything you need. Finally, play your content with EASYDCP. Don't worry if your computer plays the package really slowly. You need a fast machine to play a 2K package and you need a very fast machine to play a 4K package. If you do not have a very fast machine just figure out which bitrate (and frame size) your computer can handle, make a "test" package at that rate, make sure everything looks good, and then make the final 220 Mpbs package for submission. Validate the 220 Mpbs package by attempting playback with EASYDCP, and if the only problem with the 220 Mbps package is that it plays slowly on your slow computer, you've done everything you can with the tools at your disposal. Extra special last step: if the festival you are submitting to uses something other than EASYDCP to validate DCP packages, I strongly recommend you buy the tool they use to validate your package. Remember, you want the festival director to see your film, so make sure your package plays well with others. Good luck and send me an email if you get stuck. I can be found at live.com and my email name is the name of this blog.